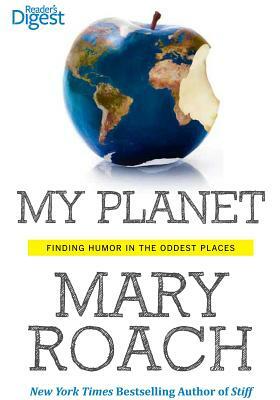 From acclaimed, New York Times best-selling author Mary Roach comes the complete collection of her "My Planet" articles published in Reader's Digest. The quirky, brilliant author takes a magnifying glass to everyday life, exposing moments of hilarity in the mundane. Best-selling author Mary Roach was a hit columnist in the Reader's Digest magazine, and this book features the articles she wrote in that time. Insightful and hilarious, Mary explores the ins and outs of the modern world: marriage, friends, family, food, technology, customer service, dental floss, and ants--she leaves no element of the American experience unchecked for its inherent paradoxes, pleasures, and foibles. Ed has crud vision, and I don't. I don't notice filth. Ed sees it everywhere. I am reasonably convinced that Ed can actually see bacteria. . . . He confessed he didn't like me using his bathrobe because I'd wear it while sitting on the toilet. "It's not like it goes in the water," I protested, though if you counted the sash as part of the robe, this wasn't strictly true. The Internet is a boon for hypochondriacs like me. Right now, for instance, I'm feeling a shooting pain on the side of my neck. A Web search produces five matches, the first three for a condition called Arnold-Chiari Malformation. While my husband, Ed, reads over my shoulder, I recite symptoms from the list. "'General clumsiness' and 'general imbalance, '" I say, as though announcing arrivals at the Marine Corps Ball. "'Difficulty driving, ' 'lack of taste, ' 'difficulty feeling feet on ground.'" "Those aren't symptoms," says Ed. "Those are your character flaws." My husband recently made me try on a bikini. A bikini is not so much a garment as a cloth-based reminder that your parts have been migrating all these years. My waist, I realized that day in the dressing room, has completely disappeared beneath my rib cage, which now rests directly on my hips. I'm exhibiting continental drift in reverse. So Ed and I were eating a lot of vegetables. Vegetables on pasta, vegetables on rice. This was extremely healthy, until you got to the part where Ed and I are found in the kitchen at 10 p.m., feeding on Froot Loops and tubes of cookie dough. Mary Roach grew up in Etna, New Hampshire, graduated from Wesleyan in 1981, and now lives in California. She has written the bestselling books Packing for Mars (W. W. Norton & Company, August 2010), Bonk (W. W. Norton & Company April 2008), Spook (W. W. Norton & Company, September 2005), and Stiff (W. W. Norton & Company, April 2003). Her articles run in Outside, National Geographic, New Scientist, Wired, and The New York Times Magazine. Her 1995 article, "How to Win at Germ Warfare," was a National Magazine Award Finalist, and in 1996, her article on earthquake-proof bamboo houses took the Engineering Journalism Award in the general interest magazine category. She also reviews books for The New York Times.